Many of you get Beyond the Bale. For those who don’t, there are some worm related articles in the current (December 2014) issue: one is on grazing management (Deb Maxwell, ParaBoss), and the other briefly reviews one of the PCR (DNA) tests developed for livestock parasitology (Lewis Kahn, ParaBoss). (PCR=polymerase chain reaction, which refers to the technology used to amplify a single or a few copies of a piece of DNA). My take regarding the “DNA test(s)”: one of the issues regarding PCR tests in diagnostic labs (that need to cover costs) is cost, including cost of sample preparation, depending on the type of test. But doubtless these costs will come down, which will be good as PCR technology has a lot of advantages. I am not sure how long the link will remain alive. I have tested both links (having been caught by dead or aberrant links before) and they both worked (for me). In talking here about resistance of roundworms to anthelmintics, I am using the current convention: the WAAVP (World Association for the Advancement of Veterinary Parasitology) guidelines on defining resistance. These guidelines set the benchmark at 95% efficacy. This is also the rule that the APVMA (Australian Pesticides and Veterinary Medicines Authority) applies when determining if a label claim of ‘effective’ with respect to roundworms is justified. (The benchmark is 90% in the case of liver fluke). It has been argued – and this is the position of WormBoss – that it is better to aim for a higher benchmark – 98% – but that is another matter. Additionally, when talking about resistant worms, we need to be clear whether we are talking about worms on-farms, or worms in a laboratory situation, which may or may not resemble the worm population from which they originally came. Often worms in the lab have undergone further and ’unnatural’ selection. The first confirmed case in Australia of monepantel (‘Zolvix’, MPL) resistant worms was on a goat farm in NSW. This was confirmed by way of a worm egg count reduction test (WECRT) on-farm, then by slaughter studies (total worm counts) at the Novartis research facility near Sydney. In this case, MPL was effective (>95% efficacy) against Haemonchus (barber’s pole worm), but there was emerging resistance of Trichostrongylus (black scour worm) and severe resistance of Teladorsagia (small brown stomach worm). MPL was used very frequently on this farm and there were animal movements to and from other goat farms – but all this and other information is being collated and will be published in due course. Monepantel resistance in sheep in Australia?? A WormMail article several weeks ago (28 October, 2014) reported “now we have confirmed cases of monepantel resistance in sheep”. Included in this article was a brief communication from Veterinary Health Research (VHR) regarding the worm isolates and an indication there was more information to come. Courtesy of VHR we now have more information which clarifies the situation somewhat. to the best of my knowledge, there are still no confirmed reports of resistance to monepantel on-farm, in sheep flocks, in Australia. It turns out that this is actually from the NSW goat property that earlier this year was reported as having the first confirmed MPL-resistant worms in Australia. (See information above). This has been confirmed at VHR to be MPL-resistant in a worm egg count reduction test (WECRT) and a slaughter study (total worm counts). The isolate came from a southwestern Queensland property, which we also now know runs sheep AND goats. MPL-resistance has NOT been demonstrated on this farm. In fact a WECRT in 2013, which tested several drenches (single- and multi-active), showed MPL to be 97.9% effective against Haemonchus. The only other drench to be >95% effective was naphthalophos (100%). (I assume the RESO method was used for the calculations). In April 2014 a further test was conducted, with only MPL being tested. Sheep deemed to be particularly wormy were chosen. The pre-treatment mean worm egg count (WEC) was ~7600 epg, ranging up to ~ 34,000 in individual sheep. Larval differentiation result: 86% Haemonchus; 14% Trichostrongylus. At day 7, the worm egg count reduction (WECR) for MPL was 99.2% for Haemonchus and 100% for Trichostrongylus. (Calculations were done by comparing post- and pre-treatment WECs in this case). Faeces from these MPL-treated sheep (i.e. ~ all? or most? MPL-susceptible worms removed) was taken to the lab for the purposes of testing. Clearly this isolate is not representative of the current worm population on this property. In short, this isolate appeared unexpectedly during routine procedures at VHR. Donor sheep were infected with a reference strain of worms which originally came some time ago from another laboratory. When the infection became patent (worm eggs appearing in faeces), it was found that this particular Trichostrongylus was present. At this stage its origin is unknown. Wherever it came from, it has been shown at VHR to be MPL-resistant in a WECRT and a slaughter study.. In conclusion, to my knowledge there is still no confirmed monepantel resistance in sheep flocks in Australia. Last edit: 20141206 (Minor edits-punctuation, italicising scientific names, adding hyperlinks etc). WormMail.2014-12-02. Prevalence and severity of drench resistance in Australian sheep worms. Plus other. 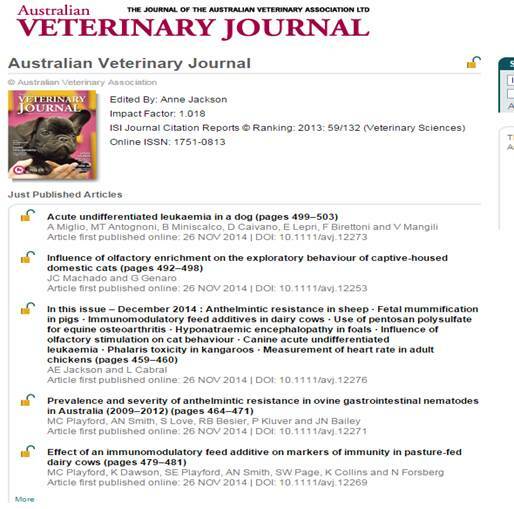 A paper by Playford and others on this topic appears in the December issue of the Australian Veterinary Journal. In the same issue, Playford and others have a paper relating to dairy cattle. It has been persistently dry in northern NSW and parts of Queensland. But, there are still occasional problems with worms in sheep and also, for example, reports of ostertagiosis in individual adult cattle on the North Coast (P Kemsley (LLS, Lismore, NSW), pers comm). The Armidale district is in the patch denoted, ‘lowest on record’. If you feel very happy – or very unhappy – with your result, remember that 50-80% of the variation in BMI is down to genetics (e.g. Volek and Phinney, 2011). This is not to discount personal responsibility, but it is easier if you had the foresight to choose the right ancestors. Also, BMI has its limitations. In short, with the benefit of further, clarifying information, monepantel (Zolvix®) resistance to my knowledge has not yet been detected / confirmed in sheep flocks in Australia.